Alex received his Master's degree in Biology from the University of Michigan in 1999. His research interests include biomedical visualization, natural language processing, and human-computer interaction. Alex has been involved in many high-profile projects at the University of Michigan. From 1997-2003, he was a lead programmer for the Visible Human project; a National Library of Medicine funded project in collaboration with the Pittsburgh Supercomputing Center. From 2003-2005 he was a lead programmer and head of the visualization group for the Virtual Soldier project; a multi-institutional project that included GE, Oak Ridge National Labs, University of Utah, University of Washington, UCSD, and Stanford. 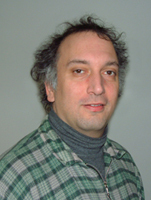 And from 2005-present, he is a lead programmer for NCIBI's natural language processing effort.